Master!! 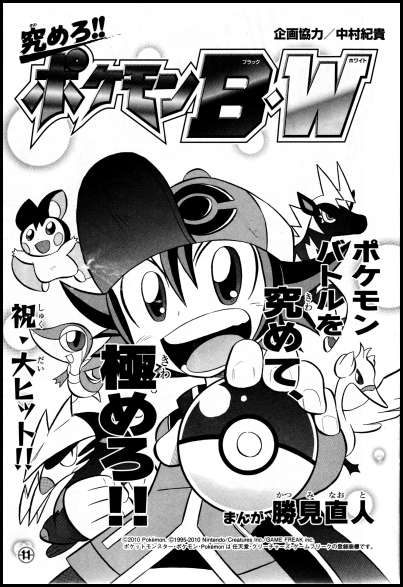 Pokemon Black & White originally started publication in the October 2010 issue of CoroCoro Comics Special. This is the story of a boy's adventure in the Isshu Region. In a forest, a boy named Monta is attempting to capture a wild Minezumi. He sends his Tsutarja out and orders it to use Vine Whip. 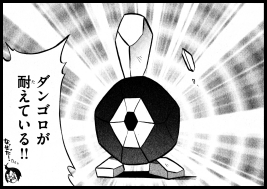 The pokemon obeys and attacks its opponent, causing the Minezumi to stagger around a bit. Monta takes this opportunity to throw a Monster Ball at it. After the ball shakes for a few moments, a clicking sound confirms that the capture has been successful. After he picks up the Monster Ball, Monta looks down at his Tsutarja and tells it that as long as they're together, there's no opponent they can't beat. Suddenly, Monta and his Tsutarja hear a rustle in the darkly colored grass behind them. When they turn around, they see both a Minezumi and a Meeruhog! 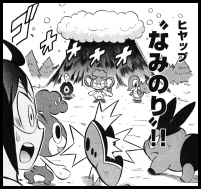 The comic's narrator explains that while only one pokemon will come out in normal grass, two pokemon will come out in the areas with darker grass. Monta's eyes light up as he realizes that he had never seen a Meeruhog before and decides that he definitely wants to capture it. He orders his Tsutarja to attack Meeruhog, so the grass-type Tackles its opponent. Just as Monta gets out his Monster Ball to catch it, the Meeruhog and the Minezumi begin to run around in circles. The young trainer can't get a clear shot of his target, so he tries to calm himself down and focus. The pokemon take this opportunity to make their getaway, foiling Monta's attempts to capture them. Just as Monta is cursing his luck, two young trainers approach him and tell him that that's not the way to do it. 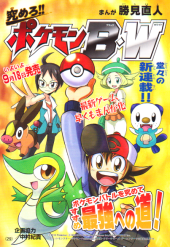 As soon as the two get close enough, Monta recognizes them as Cheren, a bespectacled young man with a Pokabu, and Bel, a young girl with a Mijumaru. 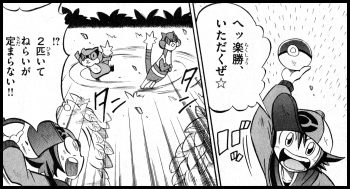 Cheren tells Monta to remember that when two pokemon come out at the same time, you have to knock out the one you don't want first (in this case, Minezumi) before you can get the one that you do what. Cheren tells Monta that he's still inexperienced, prompting Bel to speak up and say that he's said too much. Cheren goes up to Monta to apologize, but the young trainer is busy looking at the entry for Meeruhog that his Pokemon Zukan automatically created! After he pours over what little information has been added to his encyclopedia, Monta declares that he'll definitely get a Meeruhog someday. After complimenting Monta on his optimism, Cheren suggests the three of them travel together and master the art of pokemon battling. At that moment, a large, older man on a motorbike approaches the three trainers and laughs at the idea of them becoming battle masters. Monta looks up at the bike gang member silently, giving the boastful trainer the impression that he's been left speechless by his awesome power. Suddenly, Monta asks if the man, the Bosouzoku King, is a new type of pokemon that's not listed in his Pokemon Zukan! King angrily yells that he's a trainer, not a pokemon. Monta tells King that he was joking, but he doesn't care; he begins to insult the three trainers and their pokemon as being weak. Monta's and Cheren's faces suddenly become serious. King takes out a Monster Ball and tells his opponents that since they're so pathetic, they can fight him two against one. He then calls on his Wargle to battle, saying that it will be enough to beat the two of them! Monta and Cheren, who look angry now, tell King that he can talk down to them all he wants but that they can't forgive anyone who puts down their pokemon. 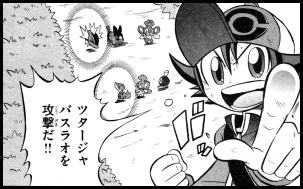 Monta tells Cheren that they have to win this battle as the trainers ready their Tsutarja and Pokabu for battle. Tsutarja starts by using Vine Whip on Wargle. The attack doesn't have much effect on the Flying-Type pokemon, so Cheren tries one of Pokabu's fire attacks. Its attack doesn't work either, allowing Wargle to counter with Wing Attack. The eagle pokemon's wings swat Tsutarja away like a bug, sending it crashing on the ground below. Next, Wargle uses Peck on Pokabu, knocking it back as well. As the two pokemon struggle to bring themselves back to their feet, King laughs at how badly the two trainers are losing. Bel and Mijumaru look on with worried looks on their faces. Suddenly, Cheren tells Monta that there is one way they can win; they can use a Combination Technique. Cheren explains that a Combination Technique can be pulled off when both Tsutarja and Pokabu combine their attacks. He asks Monta if his Tsutarja can use Grass Oath, and Monta responds that it knows the technique but has never used it before. As the two are working out their plan, King's Wargle swoops down on Tsutarja and uses Fury Attack to knock it out! 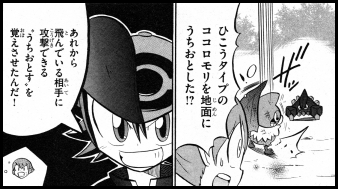 Cheren tells Monta that they can't pull off a Combination Technique if they don't have both pokemon able to battle, so he'll have to hurry up and revive it! Monta takes out an Oren Berry from his pocket and prepares to throw it at his pokemon, reminding himself that the two of them made a promise not to lose on the day they met. A flashback to Monta's first day as a Pokemon Trainer begins. 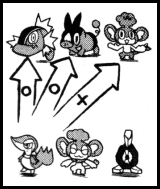 Standing in front of Monta, Cheren, and Bel are the three starter pokemon of the Isshu Region; Mijumaru, Pokabu, and Tsutarja. Monta chooses Tsutarja as his starter and tells it that they will battle to the end without ever giving up. The battle continues as King orders his Wargle to attack. Monta throws the Berry at Tsutarja, who catches the fruit in its mouth. Tsutarja eats the Berry and regains its strength, but King tells Monta that it won't affect the outcome of the battle. Cheren, seeing that Tsutarja has fully healed, orders Pokabu to use Flame Oath. Monta answers Cheren's order by telling his Tsutarja to use Grass Oath. In a huge two-page spread, a huge sea of flames envelop Wargle, overpowering it and knocking it out in one hit. Monta happily exclaims that he and Cheren have won the battle. 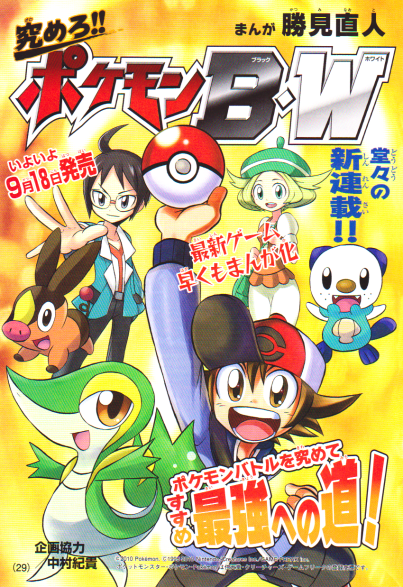 As Cheren and Bel look on, Monta exclaims that they will learn more and more about pokemon and become masters of the pokemon battle. The battle starts with Monta ordering Tsutarja, who's to Monta's far left, to attack Cheren's Yanapp, who's on his far right. Tsutarja whips up an unidentified whirlwind attack and launches it toward its target. Cheren laughs as he watches the whirlwind get smaller and smaller the closer it gets to his pokemon. Eventually, the attack dies out before it can reach Yanapp. Cheren explains that in a Triple Battle, the pokemon on opposite ends aren't able to reach each other with their attacks and can only attack the pokemon to their immediate left or right. Only the pokemon in the middle is able to attack any target it wants. After telling Monta that he'll never win against him if he doesn't even know the basics of Triple Battles, he orders his Pokabu to use Ember on Tsutarja. The attack does a lot of damage to the grass type pokemon but isn't enough to knock it out completely. Monta is happy that his pokemon was able to endure the attack but knows that if it gets hit again, it's going down. Next, Monta decides to have his Tsutarja attack Cheren's Basslhau since it's right in front of it and has a type advantage. Tsutarja is ordered to use Vine Whip, but Cheren orders Basslhau to "Move" before the attack can reach it! Pokabu trades places with the fish pokemon and takes the Vine Whip in its teammate's place. Since the pig pokemon is a fire type, the attack doesn't have much of an effect! Cheren explains that a pokemon is able to trade places with its ally and take the attack in its place. 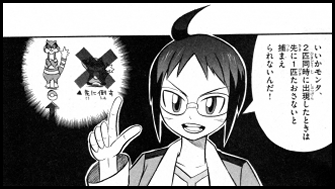 Cheren emphasizes that a pokemon's positioning in a Triple Battle is extremely important. Monta thinks for a moment and decides on a new tactic. He orders his Hiyapp to use Surf, sending a huge wave of water that hits all three of Cheren's pokemon. Basslhau and Yanapp are OK, but Pokabu, who's weak to water-type attacks, is knocked out. Monta's celebration comes to an end when Cheren points out that the attack also caused his Tsutarja to faint! An attack that hits all of an opponents pokemon also hits the user's teammates, so Hiyapp's Surf attack also affected Monta's Tsutarja and Dangoro! Since Tsutarja had already been weakened by Pokabu's Ember attack earlier, it was unable to stand up to even a water-type attack and fainted. And since Monta's remaining pokemon are weak to Yanapp's grass attacks, Cheren doesn't see any way he can lose! Monta looks somber for a moment. Suddenly, he lifts his head up and lets out an excited yell, shouting that this is the most exciting battle he's ever participated in! Monta prepares to counterattack...with Dangoro!? 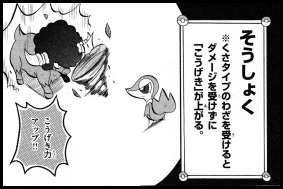 Cheren is surprised that the rock-type pokemon is still standing after Hiyapp's Surf attack, so Monta explains that his pokemon has the "Sturdy" (がんじょう) Ability. Sturdy prevents a pokemon from being defeated by a single attack and leaves it with at least one HP. Dangoro uses Rock Slide on Yanapp and Basslhau, knocking them both out simultaneously! 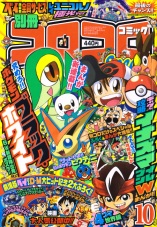 With all three of Cheren's pokemon unable to battle, Monta has won the battle! The two trainers shake hands after the battle and congratulate each other. Cheren says that it was great of Monta to battle with Dangoro's Ability in mind, and Monta says that Cheren's use of "Move" in battle really surprised him. 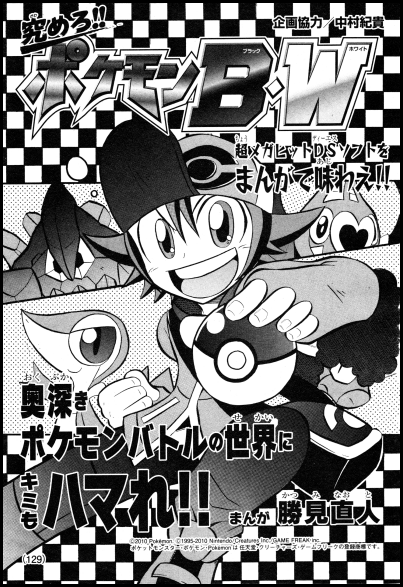 The chapter ends with Monta declaring that he wants to try Triple Battles again and challenging Cheren to a rematch. Monta and his Tsutarja are engaged in a wild pokemon battle against an Emonga. After Tsutarja weakens the electric type with Grass Mixer, Monta throws a Monster Ball and captures Emonga. Monta is excited since this is the first time he's ever caught an Emonga and wonders what it's capable of. After he puts the Monster Ball away, Monta notices a cave in the distance and tells Tsutarja that they'll head that way next. As the two walk toward the entrance, the ground begins to rumble. Before they know it, Monta and Tsutarja find themselves face to face with a Doryuuzu! Immediately, Monta orders his Tsutarja to attack. After using what appears to be Grass Mixer and Pound, Monta throws a Monster Ball and catches it. Monta leaves the cave and looks down at the Monster Balls containing the two pokemon he just captured. After thinking how great it'll be to use them in battle, Monta spots a young man in a hat. He identifies the man as a Pokemon Ranger (as in the trainer class) and challenges him to a battle. The young Ranger, excited to see an opponent so confident, accepts. The unnamed Ranger sends out a Zebraika, an electric type, and a Swan'na, a water and flying type. 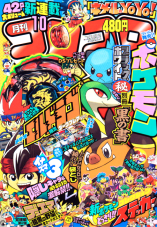 On Monta's side is Emonga, an electric and flying type, and Tsutarja, a grass type. Monta begins the double battle by ordering his Emonga to use Electric Ball against Swan'na since it'll do a lot of damage to the water type. Much to Monta's surprise, the ball of electricity is pulled away from Swan'na and drifts toward Zebraika! The attack hits the electric pokemon instead of its target, causing no damage! 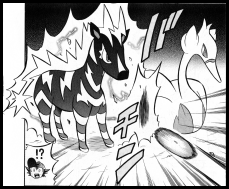 Monta is confused, so the Pokemon Ranger explains that Zebraika has an Ability called "Lightning Rod" that draws all electric attacks to it and increases its Special Attack. It seems that Monta is going to have to defeat Zebraika first if he ever wants to hit Swan'na with an electric attack! Next, the Pokemon Ranger begins to attack. He orders Swan'na to use Tsubame Gaeshi on Tsutarja, and it obeys. The attack does a lot of damage to Tsutarja because it's a grass type, but it's still able to stand. However, Monta knows that it'll only take one more attack to knock out his pokemon and wonders what he should do. His opponent begins to taunt him by saying that he's no match for him. As Monta stands frozen with indecision, he notices a Monster Ball in his bag. At that moment, he remembers that he still has another pokemon he can use! Monta recalls his Tsutarja and calls out Doryuuzu to take its place. Doryuuzu is ordered to use Sandstorm, changing the weather conditions of the battle. The Pokemon Ranger recognizes that Monta is changing up his strategy but says that it still won't be enough to defeat him. Next, Doryuuzu is ordered to use Dig on Zebraika. The mole pokemon digs underground, just as the Ranger thought. Surprisingly, he decides to ignore Doryuuzu and focuses on attacking Emonga instead. After Swan'na attacks Emonga with Bubblebeam, the Ranger explains that his Zebraika is strong enough to take Doryuuzu's attack even though it has a weakness to Dig. At that moment, Doryuuzu emerges from the ground and attacks Zebraika. Dig connects and knocks Zebraika out in one hit! 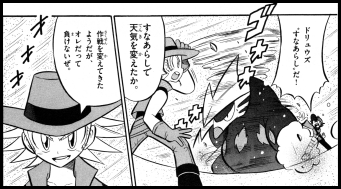 The Ranger is astonished; even though ground-type moves are effective against electric types, Doryuuzu's attack shouldn't have been able to one-hit KO is pokemon like that. Monta explains that his pokemon has an Ability known as "Sand Power." This Ability increases the power of ground, rock, and steel type moves whenever a sandstorm is brewing. This gave Doryuuzu the power boost it needed to be able to take out Zebraika in one hit. Now that Zebraika is defeated, Emonga's electric-type attacks will be able to hit its opponent now! Emonga is ordered to use Electric Shock on Swan'na, knocking the pokemon out in one hit. The battle is over, and Monta has won! The Pokemon Ranger congratulates Monta, telling him that he has a great understanding of pokemon Abilities. With another victory under his belt, Monta declares that he'll make lots of new friends and become a master of pokemon battling. Monta and his Tsutarja stand in front of the Battle Subway, ready to challenge the trainers inside. 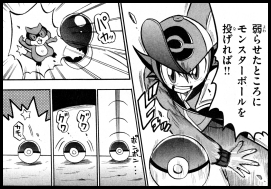 As Monta enters the Gear Station, he becomes excited at the idea of battling trainers inside a train. He reminds himself how trainers who win receive Battle Points (BP) that can be exchanged for prizes later on. The train takes off. Inside, Monta's Tsutarja and Gantle make quick work of an unknown trainer and his Baopp and Gamagaru. He continues battling trainers, defeating what appears to be a small child's Meguroc, a girl's Kurumiru, and another girl's Chobomaki. At the end of it all, Monta's accumulated 48 BP and feels pretty confident that he can't lose. Suddenly, he's approached by a Young Master ("Rich Boy" in the English versions of the games) named Dol and is challenged to a battle. Monta is put off by the young boy's flashiness but decides to accept his challenge anyway. 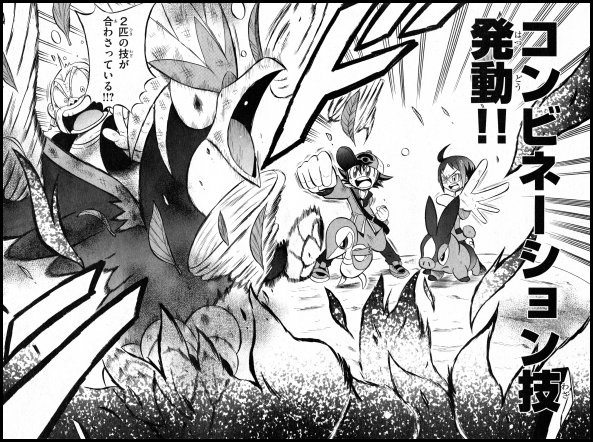 The double battle's participants are Kokoromori and Buffaron on Dol's side and Gantle and Tsutarja on Monta's side. The battle starts with Monta ordering Tsutarja to attack Buffaron with Grass Mixer. The attack hits but has no effect on the buffalo pokemon, causing Monta to wonder what's going on. Dol explains that Buffaron has "Herbivore," an Ability that prevents the pokemon from receiving damage from grass-type moves while increasing its own attack power. Dol takes advantage of Monta's confusion by ordering Buffaron to counter with Horn Thrust. The attack connects, knocking out Tsutarja in one hit! Monta turns his attention to his Gantle and decides to use a rock-type move on Dol's Kokoromori, a flying-type. Before Monta has a chance to issue an order, however, Kokoromori uses Fly! This puts Dol's pokemon out of Gantle's reach and prevents it from attacking. Dol's Buffaron attacks Monta's Gantle, knocking it out. 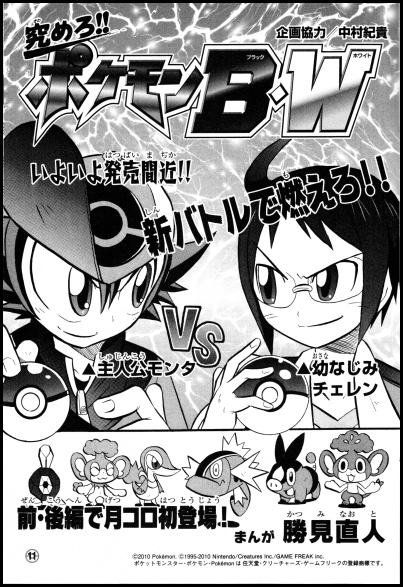 As the battle comes to an end, Dol tells Monta that his pokemon are no match for his Buffaron and Kokoromori. Monta is not willing to let this defeat go, so he tries his hardest to figure out a way to beat Dol. As he walks around a station, he comes across a counter for exchanging Battle Points for items. Monta stops at the counter, browses the display, and decides to cash in his BP for a prize. Several days have passed. On a paved path dividing a forest in two, Monta is running with his Tsutarja. He looks into the distance and sees Dol feeding a Berry to his Buffaron, so he approaches him and challenges him to a rematch. Dol recognizes Monta as the boy from the Battle Subway and asks if he really wants to be humiliated again. Monta responds by saying that he's grown a lot since then and that he won't lose. The rematch begins using the same pokemon as before. Dol laughs, saying that he told Monta that his Tsutarja and Gantle were no match for his pokemon. Eager to get the battle started, Dol orders his Kokoromori to use Fly. The flying-type pokemon rises into the air and puts itself out of Gantle's reach, just like before. Next, Dol orders Buffaron to use Afro Break on Tsutarja. As the attack hits, Dol tells Monta that no matter how many times they battle, the outcome will always be the same. Suddenly, Dol notices that Tsutarja wasn't affected by Buffaron's attack! The grass-type pokemon managed to use Protect before Buffaron's attack could connect, preventing it from taking any damage. Dol smiles and concedes that Monta has grown a little. Next, Monta goes on the offense. He orders Gantle to use Shoot Down, knocking Kokoromori to the ground! 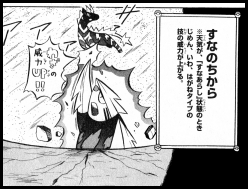 Dol is baffled, so Monta explains that Shoot Down is an attack that drags flying pokemon to the ground, putting the pokemon within attacking range. Dol responds by having Kokoromori use Heart Stamp. Gantle is able to withstand the attack due to its Evolutionary Miracle, a hold item that raises the defense and special defense of pokemon who haven't fully evolved. Monta orders Tsutarja to use Grass Mixer on Kokoromori, and Dol orders Buffaron to use Mega Horn on Gantle. 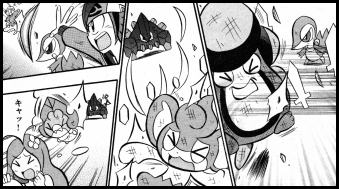 As the trainers battle, Dol can see that Monta has become skilled enough to give him trouble. Monta tells Dol that he'll win with Gantle's next attack, but Dol thinks he's bluffing. Suddenly, the ground begins to shake and Gantle releases Level the Ground! The attack hits both Buffaron and Kokoromori, due to the fact that it was grounded by Gantle's Shoot Down earlier. In addition, since Kokoromori is a flying-type, a rock-type move like Level the Ground is very effective! Once the earthquake stops, both of Dol's pokemon are noticeably weaker. Dol congratulates Monta on trying to attack both of his pokemon at once but reminds him that Level the Ground works on all pokemon. This means the attack had to have hit Tsutarja, especially since it wouldn't have been able to use Protect. As the smoke clears, Monta tells Dol that he is correct about Tsutarja not being able to defend itself. However, Tsutarja was able to get by unscathed because it has a Balloon! 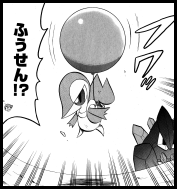 A Balloon is a hold item that causes a pokemon to float in the air, protecting it from its opponents' attacks. Monta reveals that he bought the Balloon using the Battle Points he got on the Battle Subway. He then reminds Dol that Gantle's Level the Ground attack has the added benefit of lowering the speed of everyone it hits. Now that Buffaron and Kokoromori are slowed down, Tsutarja moves in to attack. It uses Slam on the weakened Kokoromori, knocking it out. Next, Gantle is ordered to use Stone Edge to finish off Buffaron. The attack hits, knocking Buffaron out and earning Monta a victory. As the young trainer cheers, Dol thinks about how amazing it is for him to have grown so much from the experiences he's gained on the Battle Subway. He admits defeat to Monta but says that he'll be the one to challenge him next time. 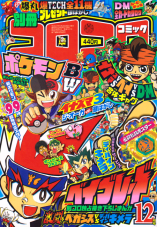 Monta says that he'll accept his battle invitation anytime and that he will become a master of pokemon battling. 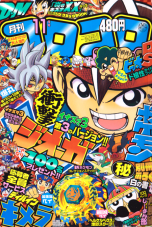 The February 2011 issue of CoroCoro Comics Special will go on sale on December 29th, 2010.